[prMac.com] Southborough, Massachusetts - Are you excited? We are! Flat Earth Studio LLC today announces that a Free version of Sarah Seidelmann's app, based on her book, "What the Walrus Knows: An Eccentric's Field Guide to Working with Beastie Energies," is now available. It's got 15 fabulous Beasties to help guide you including honey badger, elephant, owl and horse. Please help us spread the word, will you? "The inspiration of the Beasties can now spread like a wildfire...the free version is here!" said Sarah Seidelmann. "Each Beastie has guidance to help YOU align with your highest and best self. Step into your own brand of awesomeness with help of the wild! Word on the trail is that kids and teens love it too....it's fun for the whole tribe from age 3 to 103!" 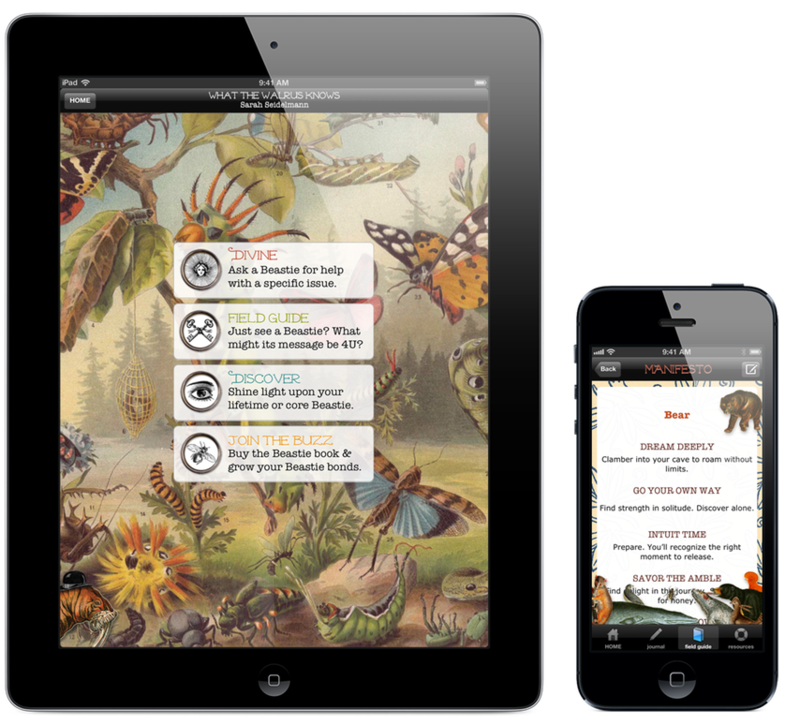 A single in-app purchase unlocks all of the features found in the full version, including: 150 more Beasties, an integrated journal, and a 16 minute guided shamanic meditation into the lower world, to help you find and connect with your core Beastie. Sarah Bamford Seidelmann, MD, is a Board-Certified physician who left her pathology practice in order to live out her destiny as a salty goader of humans. In her own life and in her practice as a life coach, speaker, and writer, she loves to ask the question, "How good are you willing to let it get?" Learn more about Sarah online at Follow Your Feel Good online. What the Walrus Knows 2.1 is available for Free through the Apple App Store in the Lifestyle category. A single in-app purchase for $4.99 (USD) enables all of the features found in the full version. Please contact us for interview and/or commentary. Located in Southborough, MA, Flat Earth Studio was founded in 2006 by Brian Arnold. Flat Earth Studio develops premium lifestyle apps for the iPhone, iPod touch and other mobile devices. All Software (C) 2014 Brian Arnold, All Rights Reserved. Apple, the Apple logo, iPhone, iPod and iPad are registered trademarks of Apple Inc. in the U.S. and/or other countries. Other trademarks and registered trademarks may be the property of their respective owners.